This coin shows an embosssed letter on the obverse of a Washington Dollar. The letter matches the incused edge letter O in GOD. This is not a dropped letter error!. Photo by Danny Chapman of xpcoins.com. The Presidential Dollar is proving to be a coin type with plenty of errors, including some relating to the edge lettering, but so far I haven't seen a single instance of a genuine "dropped letter" type error for sale on eBay! Learn what is and what isn't a dropped letter error on these the Presidential Dollar coins, and then follow my list of all confirmed important obverse and reverse Presidential Dollar errors, including edge lettering errors, which have been confirmed by experts. If you'd like to get up to speed on the basics of this coin, read All About the New Presidential Dollar Coins. First of all, let's understand what the correct, normal edge lettering appearance is for a business strike (circulation issue) Presidential Dollar. The edge lettering should be incused (sunken into the edge of the coin) and run all the way around the edge of the coin. It doesn't matter whether the heads or tails side is facing up on business strike dollars because the edge lettering is applied randomly, so a coin with upside down edge lettering is NOT an edge lettering error! It is simply a normal variety, being called by some as a "Type 2" Presidential Dollar. The most common non-error (beside upside down edge lettering) being reported pertains to so-called "dropped letters," extra letters or numbers, and other types of "extra" writings on the Presidential Dollar edges. Although there are several legitimate and verified Washington Dollar edge lettering errors, most edge lettering related oddities being reported are not errors, but artifacts of post-mint processing. Such non-errors are usually faint marks that look like letters, or spots where the edge lettering has one or more defaced or obscured letters. Most of this damage is from coins bumping together during the edge lettering process itself, or movement of large, heavy batches of finished coins at the Mint and beyond. Some of these marks are the result of the coins being put through coin counting and wrapping machines. Look at a few dozen Presidential Dollars under good magnification (8x to 10x). Pay particular attention to the edge lettering on these coins. You will quickly see marks that look like file marks and other marks, you'd consider to be a bag mark, contact mark, or "ding" if you saw it on the obverse or reverse of the coin. You'll also see little squiggly-type marks, caused by coins rubbing together. 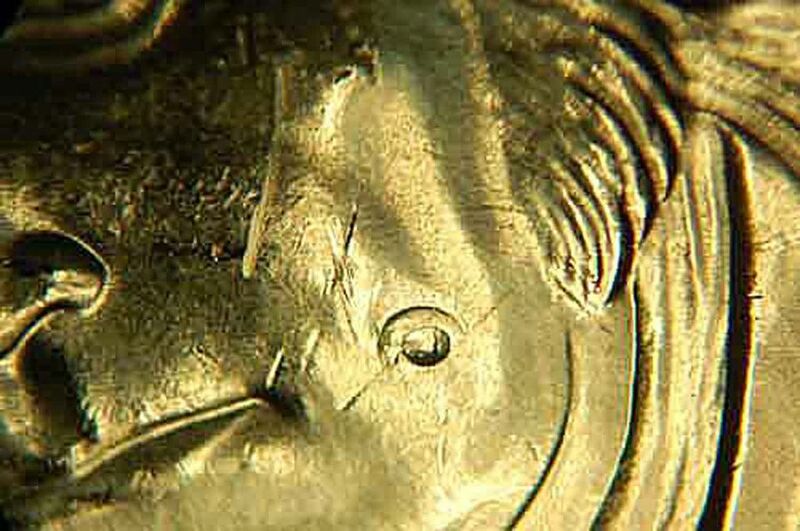 All in all, you'll see many types of marks that appear regularly on the obverse and reverse of coins, but because we're seeing these marks in a completely new context now on these Presidential Dollars' lettered edges, many people hoping to find errors are seeing "normal" things as edge lettering errors instead. The so-called obverse and reverse "dropped letters" on the edge are actually just embossed letters and numbers coming from the surfaces of other Presidential Dollars! These embossings are caused by coins which are bumping very hard against each other, and are really a "non-error" (some experts simply call it "damage.") If you look carefully, you will see that the obverse or reverse letter which shows up on the edge is in reverse or mirror image form. This is because the obverse and reverse so-called "dropped edge letters" are simply coming from bumping against other coins. Another type of easily confused edge lettering non-error is the raised impression of an extra letter on the edge or the surfaces which match the edge lettering font. The edge letters, being incused, or sunken in, are acting almost like coin dies, and imparting raised impressions of themselves on the edges and surfaces of other coins, due to hard bumping. Again, unless the letter is an O or other symmetrical letter, it will appear in mirror image form. These are not "dropped letters," but merely embossed letters coming from other coins. Although these types of embossings are interesting, they should also be considered damage which was caused as a result of coins bumping together. Sometimes you can even see the straight-line impression of the edge of the coin right next to the embossed letter! The Bottom Line - 99% of So-Called "Dropped Letter" Errors on Presidential Dollars are Actually "Embossed Letters"
As of right now, due to the not uncommon embossings taking place on these Presidential Dollars, it will probably require an expert to authenticate a genuine "dropped letter" error. Having a letter from the obverse or reverse, appearing in incused (sunken in) form on the obverse or reverse, is a promising sign of a genuine "dropped letter" type error, but be sure to rule out any occurrences of edge-letters-to-surfaces, and surface-letters-to-edge marks as "embossed letter damage." Missing Edge Lettering - Mostly referred to now as the plain edge dollars; also called the Godless Dollars, or smooth edge dollars. No edge lettering was applied to the coins. An estimated 80,000 to 100,000 Philadelphia Mint specimens exist, mostly found in the greater Tallahassee, Florida area; Denver Mint specimens are widely dispersed, with reports from 7 states including Illinois, Indiana, California, New Mexico, Texas, Arizona, and Wisconsin. The largest number of D-Mint specimens has emerged from the southern California area, about 75 to 100 miles north of Los Angeles, although reports are known throughout the state. The first plain edge coin (D-Mint from Chicago) was publicly announced by "Chicago Ron" Guinazzo and sold for $612 on eBay; Maximum price seen was $1,875 for an NGC certified "generic" specimen. Doubled Edge Lettering, Two Impressions - Washington Dollar edge lettering appears twice, in two very clear sets of letters. The coin was obviously run through the edge lettering segment twice, with the second impression having such placement that the first impression is clearly visible. No coins sold as of yet; only three specimens known to exist; first reported by Shawn & Michelle Bell. This error appears extremely rare, considering everyone is paying so much attention to the edges. Blank Planchet With Edge Lettering - One confirmed specimen, found in Fort Collins, Colorado, from a Denver roll, and authenticated by PCGS. Finders Ray & Mary Smith say they're not selling it. Blank Planchet, No Edge Lettering - At least 75 confirmed specimens, probably at least 200 exist. They're being found all over the United States, from both mints, as is typical for this type of error. What is not typical is hearing of so many so soon. May turn out to much more common than Sacagawea blank planchets, especially considering we have a LOT of Presidents yet to go on the same planchet type. Highest price I saw was $1,000 as a Buy-It-Now sale on eBay. Missing Clad Layer - The coin is missing the reverse clad layer, which was lost before striking, and was discovered by Mary C. in Michigan. It is on its way to NGC now. Authenticated (by Tom DeLorey) tentatively based on photos, weight, appearance and my careful interview of the coin's owner. Unknown value at this point. Broken Planchet - The planchet had a small piece broken off before the burnishing process, which caused the otherwise normally struck coin to get stuck in the edge lettering machine. Lettering shows multiple times near break, then fades away. Unique specimens, 3 varieties known. Rotated Die Axis - The die axis is rotated aproximately 93%, meaning that when you hold the coin with Washington's head up, and then turn the coin over from top to bottom, the Statue of Liberty is standing at about a 93% angle. Although several minor rotated die axis errors are known (all within legal mint tolerances) this is the first (and so far only?) major rotated die axis. Unburnished Planchet - Confirmed reports of several dozen specimens. There may be two types of this error, one a black, sort of burnt-looking type planchet, and the other a dull, dark brass-like color. I have confirmed the non-burnt type; several dozen reported to me, many more on eBay, total number unknown. Die Clash - Usually referred to on eBay as an "extra spike on Liberty's crown," minor die clashes probably number in the thousands. Several specimens showing very strong clashes are also known. Wounded Liberty - A spear-like crack run across Liberty's midsection, with specimens ranging from strong cracks to barely noticeable ones. Wild Whisker - A die crack on Washington's chin, with specimens ranging from long crooked, but thin cracks extending across the chin and beyond in both directions (NW to SE), to a barely noticeable 1 mm crack. "Filled Die" Missing Obverse Inscription - A remarkable error type where "mint goop" has filled the letters of the entire lower inscription on the obverse die. (Mint goop is a concoction of machine grease, tiny metal filings, dirt, and other material.) On the two specimens I have seen photos of, the lower obverse inscription is simply GONE, with little or no evidence of a "struck-through-grease" appearance to the coins. About 6 specimens reported. Struck Through Grease Errors - Numerous typical struck through grease error specimens are known. These are not uncommon, and unless they're extreme, they're not worth much, if anything. There are a couple of unconfirmed reports of fingerprints struck through grease into the surface of the coin. Doubled Edge Lettering, Coin Got Stuck - Edge lettering appears doubled or tripled in a very small section of the edge, where it seems to have gotten stuck or jolted in the edge lettering machine. The number of specimens is unknown, but they seem to be rare, although not worth very much. Mis-Aligned Edge Lettering - The edge lettering appears with abnormal spacing compared to normal coins; one or more letters may be too close to their neighbors, or spaces may be longer or shorter than they usually are. The suspected cause is "slippage" of the coin during the ride through the edge lettering groove, perhaps from the machine being slowed down for a second, or stopped and restarted. With an unknown number of specimens, this error appears to be rare. Mis-Aligned Edge Lettering, Type 2 - These types of coins have normal edge lettering spacing and all, but it starts in a different place when all the coins are lined up like the wheels in a safe. The specimens are usually found in groups, with several in an affected roll. The edge lettering on them all start and stop in the same place (relative to, say, the dates all being lined up,) with different spacing than 99% of the rest of the coins. This is a possible edge lettering segment die variety! Confirmed by photos, about 3 dozen specimens reported to me from 4 different sources. Total number of specimens out there is unknown. Split or Cracked Cladding - I have seen two Washington Dollars that have minor "clamshell type" split cladding all the way around the edge. One was 360 degrees around, the other about half that. The split was very tiny, about half a millimeter or less. Others are certain to exist; you need magnification to see the cracks. Also, I found a cracked obverse clad layer while searching rolls myself. It has a teeny crack across the entire face, from one rim to the other; once again, it was not visible to the average naked eye. Upside-Down Edge Lettering - Upside-Down edge lettering on business strike (normal circulating dollars) is not an error. Unfortunately, the U.S. Mint Customer Service Agents (their call center) were telling people who called in to ask that upside edge lettering on regular circualtion strike coins was an error. This created a lot of confusion, and took numerous conversations with the call center supervisors and managers to set the record straight. No sooner had the scores of emails a day about this finally tapered off, than they started anew! I finally had to call an executive at the U.S. Mint and ask him to intervene. Folks, no matter what the U.S. Mint Call Center tells you, upside-down edge lettering is NOT an error unless the coin is in (or came from) a Proof Set from the Mint. Slightly Raised "Extra" Letters on the Edge - These are not errors. Because the edge lettering is incused (sunken into the edge,) we are seeing a relatively new phenomenon where these incused edge letters are producing raised images on the edges of other Presidential Dollar coins during manufacture at the mint, possibly during the vacuuming-up process that loads the coins into the feeder for the edge lettering segment. Whatever the cause, raised impressions of extra edge letters are not errors. Depending upon how the collecting community receives and grades this new phenomenon, this entry might be moved down to "damage." Details about this phenomenon can be found in the Presidential Edge Lettering Errors article. Extra Ring Around the Obverse (or Reverse) - These rings, about 1/4 inch to 1/2 inch or so away from the rim (on one or the other of the faces of the coin) are caused by coin wrapping machines that are pressing the crimped end too roughly against the roll of coins, thereby damaging the coin on the end. Buffy Dollars - These are faked plain edge dollars, where some enterprising thief has used a dremel or other tool to buff off the inscription on the edge of the dollar, hoping to pass it off as a genuine plain edge specimen. Here is some information about how to detect Buffy Dollars. Note: This list is not complete, because new errors are always being found. Have You Seen This First Known, Authentic Sacagawea Dollar?